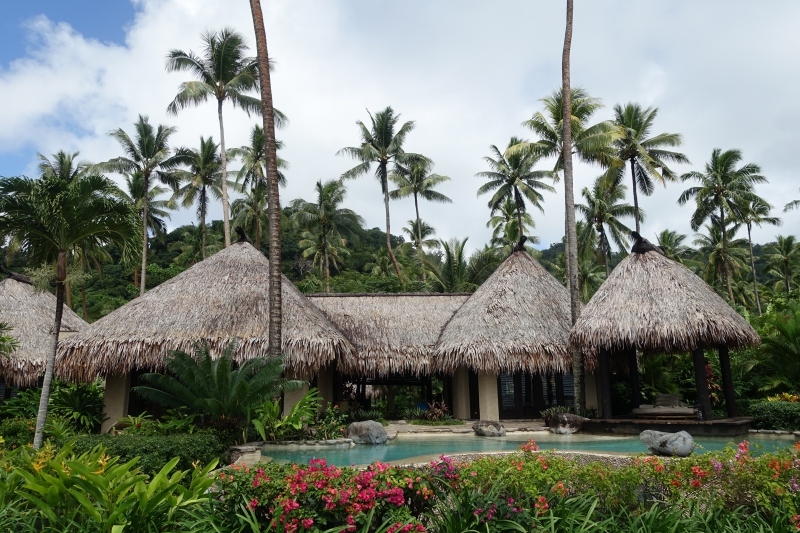 Laucala Island is an exclusive private island in Fiji owned by Dietrich Mateschitz, the founder and CEO of Redbull. He bought it from the Forbes estate, and the island was so beloved by Malcolm Forbes that he was buried there (although the Forbes family have since removed his remains). Experience Laucala for yourself with this YouTube Video; don't forget to subscribe to TravelSort on YouTube to be alerted to new videos. 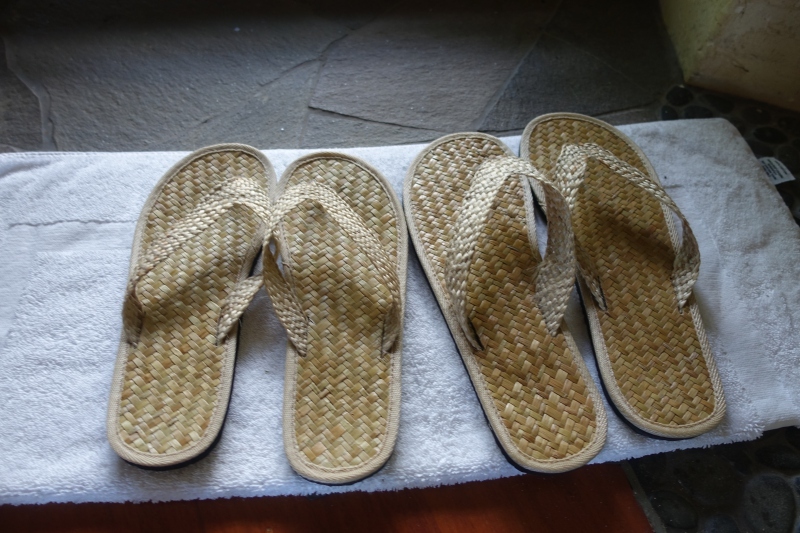 After our brief visit to the Laucala Lounge in Nadi, we ran our hand baggage through security for the private aviation section of Nadi Airport and were directly escorted to our flight, which had 6 seats. In no time, we were airborne and on our 50 minute flight to Laucala, which has its own airstrip. On arrival, we were serenaded by several staff singing in Fijian, given a Fijian lei, and offered young coconut juice. We were personally greeted by Petra Trapp, the new General Manager, and I’ll have a future post with an informal interview of her. We were then escorted to a waiting luxury SUV that drove us to our Plantation Villa. 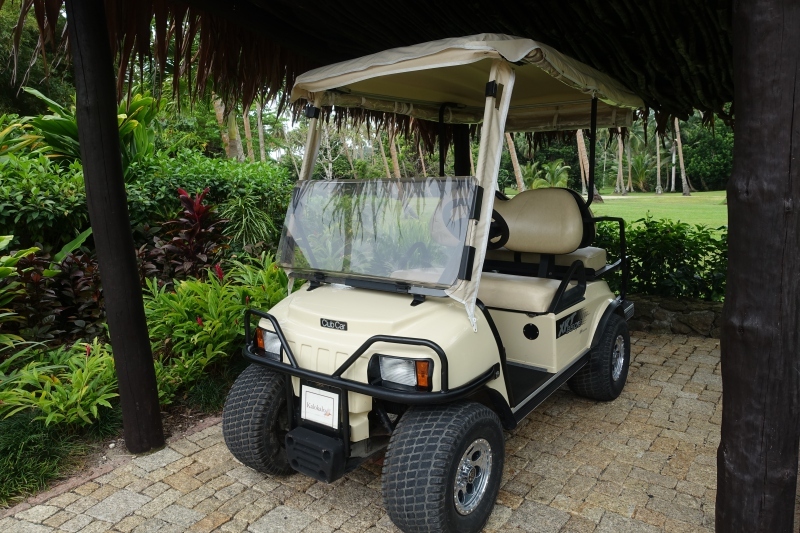 Each 1 bedroom plantation villa comes with its own golf buggy that you can use to drive yourself anywhere on the island. If you don’t want to drive yourself around, you can of course call for a buggy, but we loved the freedom of having our own buggy. 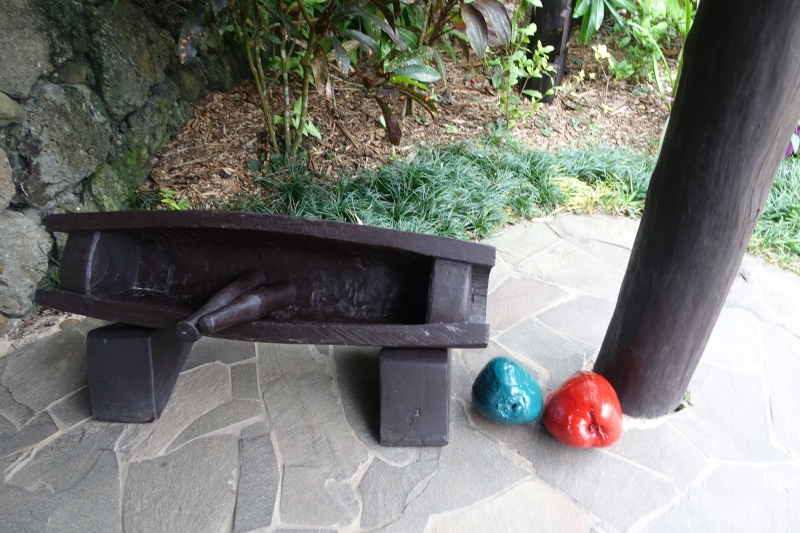 Just in front of the gate to the villa, there’s a wooden trough with some mallets, as well as painted red and blue coconuts. 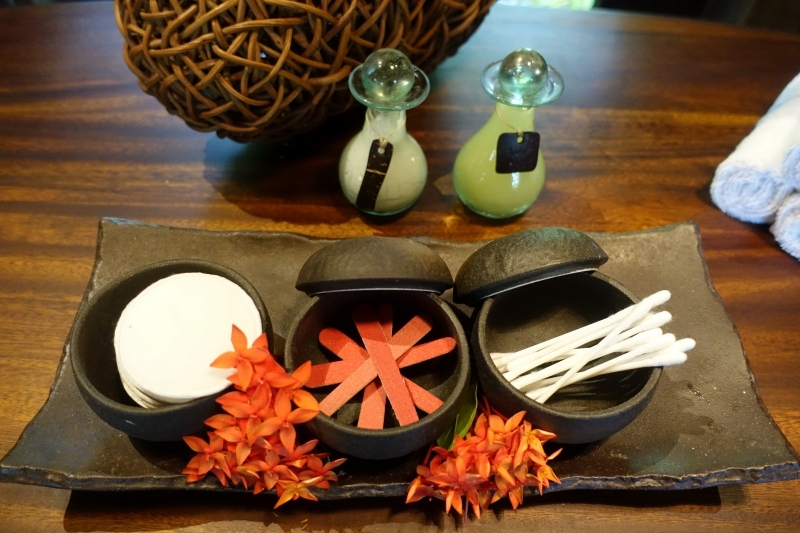 The mallets are used for staff to announce that they’re coming in, while the red coconut is used as a “do not disturb sign” and the blue coconut is a “please clean my villa” sign. 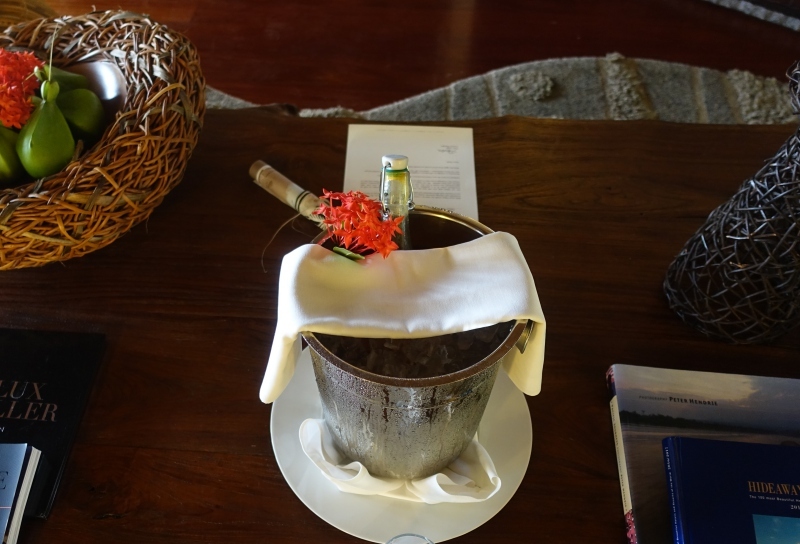 We really only used the red coconut at night, and never had occasion to use the blue coconut, since housekeeping staff were superb at cleaning our villa in the morning when we were out and about, and again in the evening for turndown service, when we were at dinner. The 1BR Plantation Villas each have their own private pool, which our son enjoyed several times. 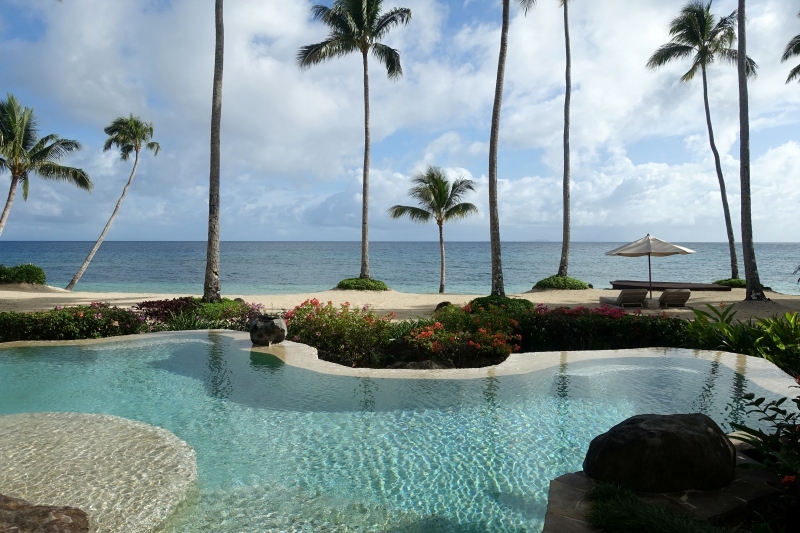 It’s only a few steps away to the beach, and while we once saw horseback riders ride across it, it was otherwise completely private and we never saw another soul even though there were about 25 other guests on the island during our visit. On the left was the living room building, as it was completely separated, with its own doors, from the rest of the villa. 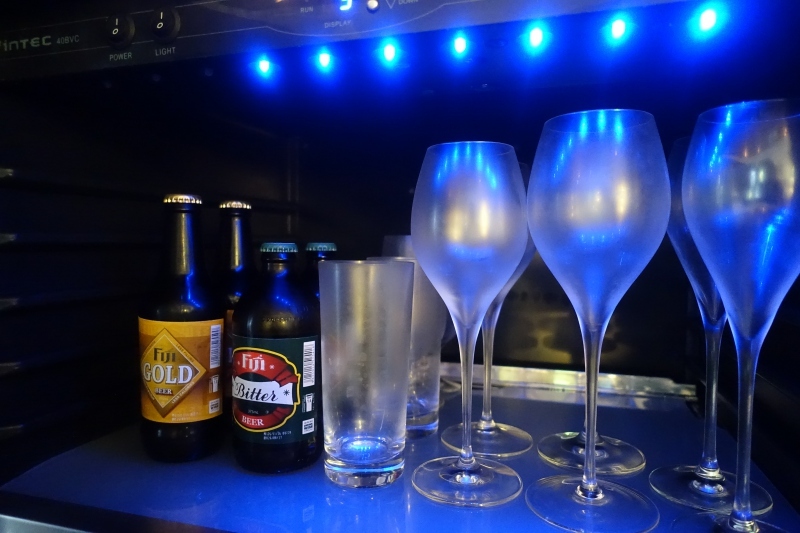 This made it the perfect place for our son’s extra bed, since we were able to put him to bed earlier, and not have to worry about turning off all the lights or whispering until we went to sleep. Fresh fruit, tea, and freshly squeezed juice were arranged as welcome amenities. 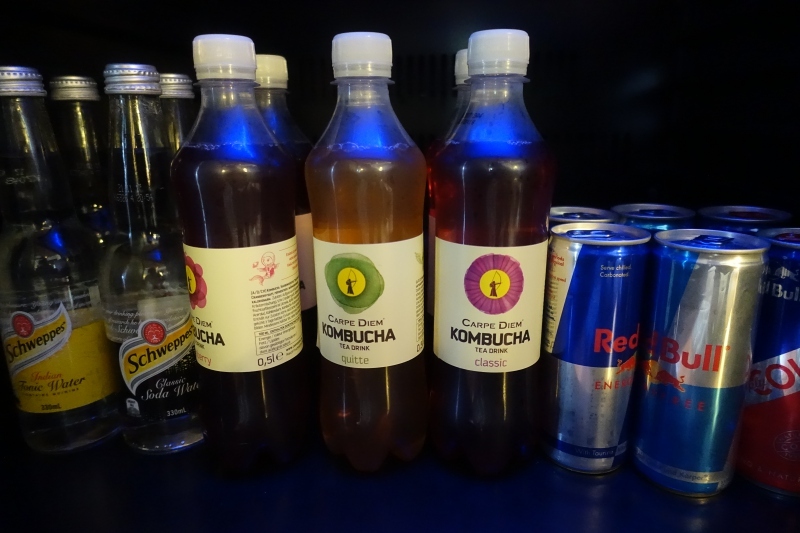 Every day a new bottle of fresh squeezed juice was also placed in our mini bar, a lovely touch. 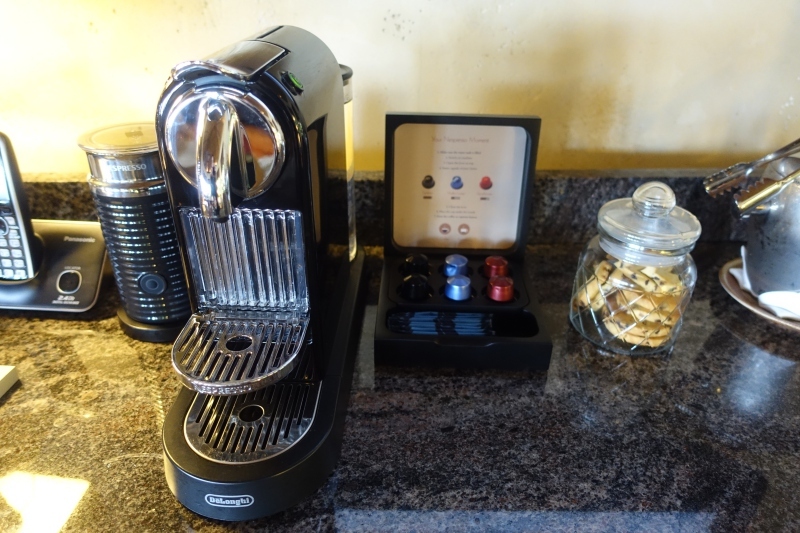 There was also a Nespresso machine, a milk frother, and complimentary chocolate chip cookies. 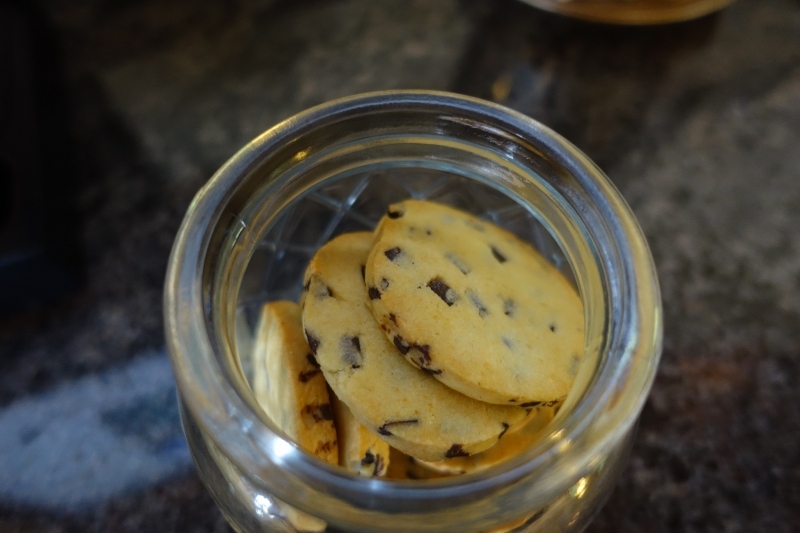 But even if you prefer French Press coffee, there was ground coffee (regular and decaf) and a French Press. And not only were there tea bags; there were various whole leaf teas and a tea pot—easily the most comprehensive coffee and tea set up I’ve ever seen. 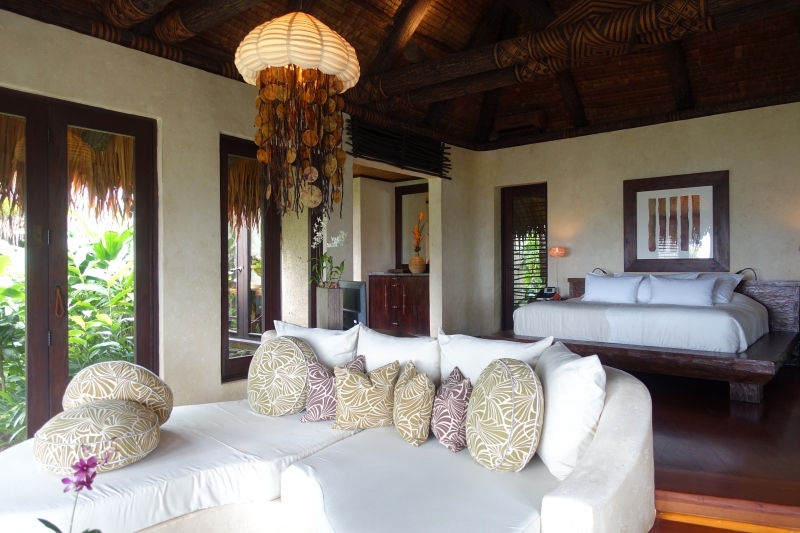 In the main part of the villa was the bedroom, with a sunken living room furnished with a curved sofa and jellyfish-inspired light. Something to note is that there aren’t blinds or shades in any part of the villa, so eye masks are provided should you not want to be woken up at sunrise. 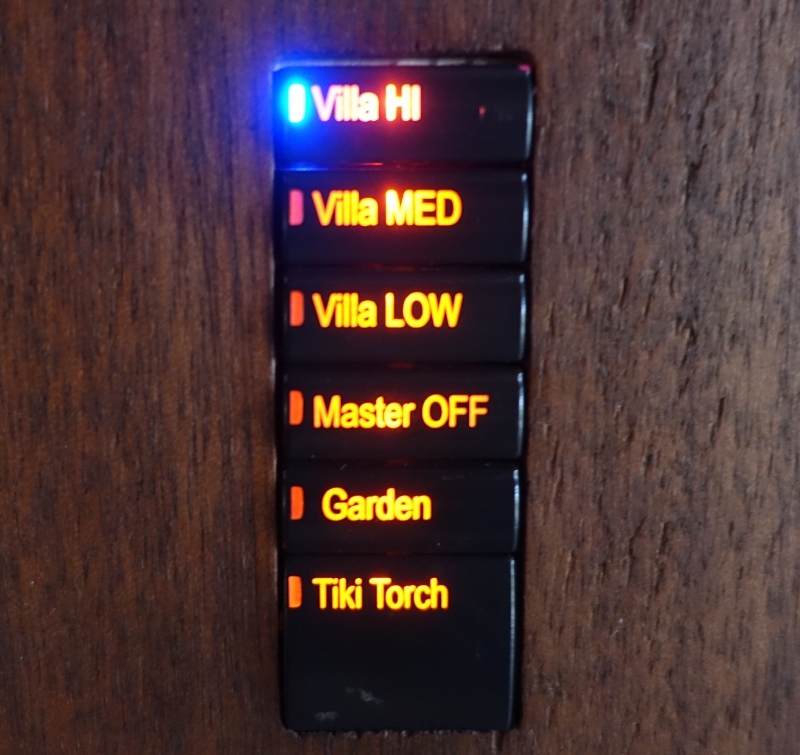 Villa lights, including the evening tiki torches, were easily adjusted with the light control panel. 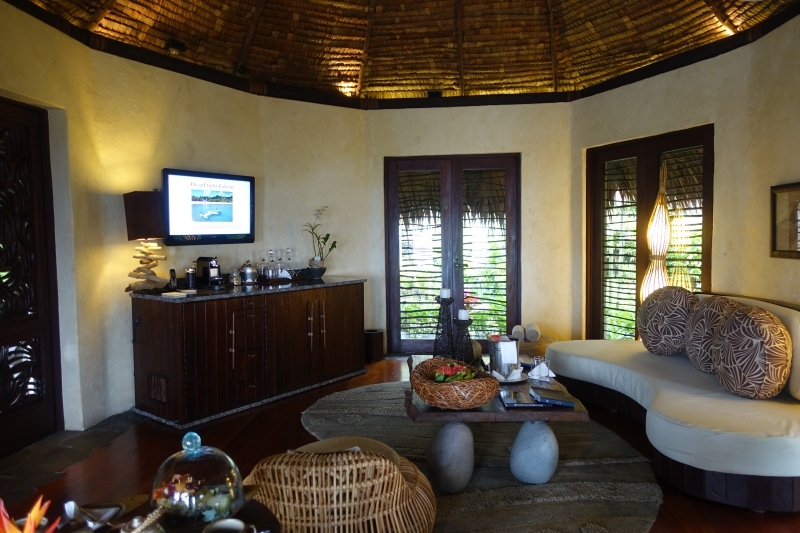 The air conditioning worked well and kept both parts of the villa consistently cool; on a couple occasions we even turned it off as it was cool enough outside (our late August visit coincided with the end of the Fijian winter, since Fiji’s in the Southern Hemisphere). There were lovely bird of paradise-like tropical flowers in the villa, and everything had been thought of, from power adapters to mosquito repellent (although there must be excellent insect control as we never had to use it, nor did I ever find any bugs in the villa) to slippers and hats for guest use. 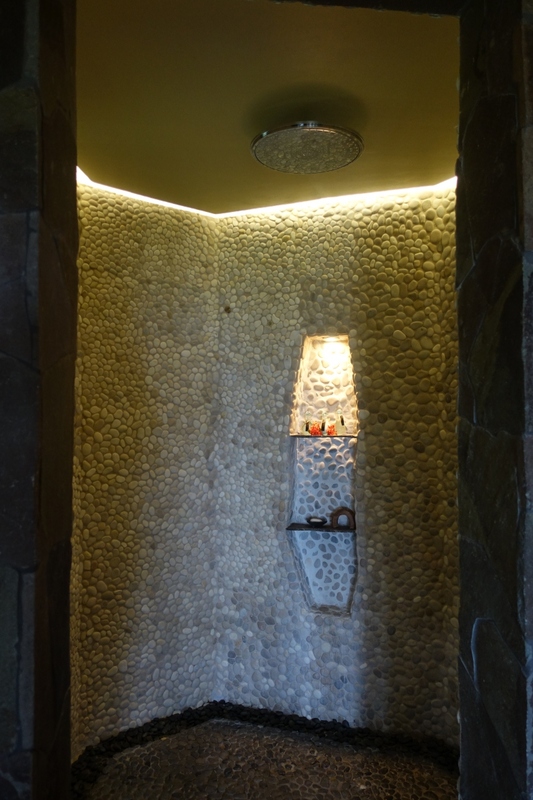 The large stone soaking tub easily fit two people, and the walk-in shower could have accommodated a pro basketball player. 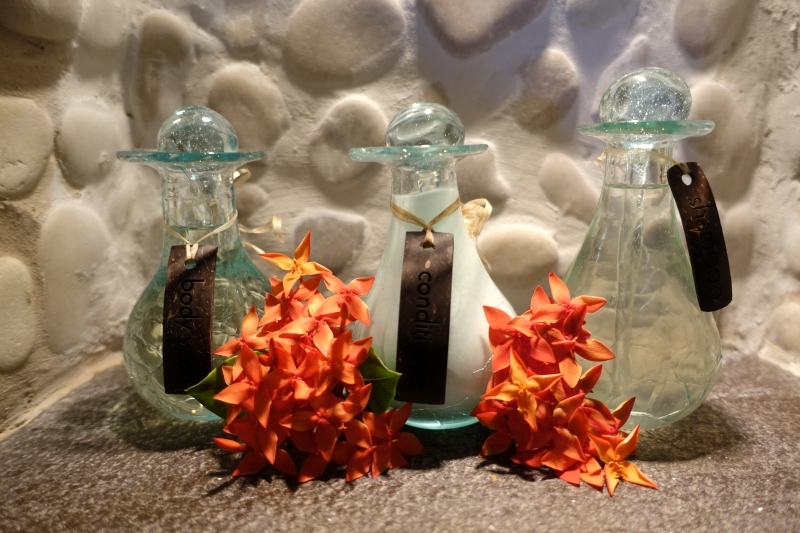 I especially enjoyed the bath products, all of them made by hand and infused with essential oils, in the Laucala Spa. 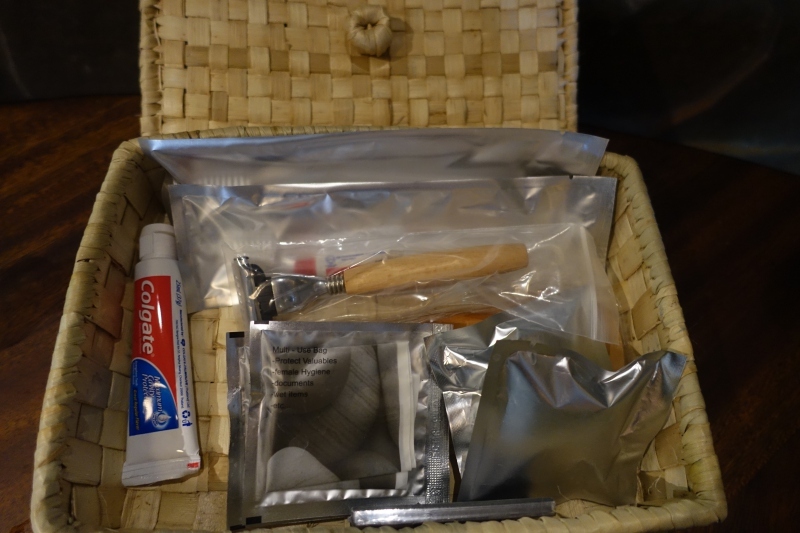 A woven basket contained additional toiletries, such as dental kits and razors. What I especially appreciated was the complimentary laundry. All we had to do was place clothes to be laundered inside the basket, which was picked up morning and evening. Clothes were laundered and returned clean the following day, folded. 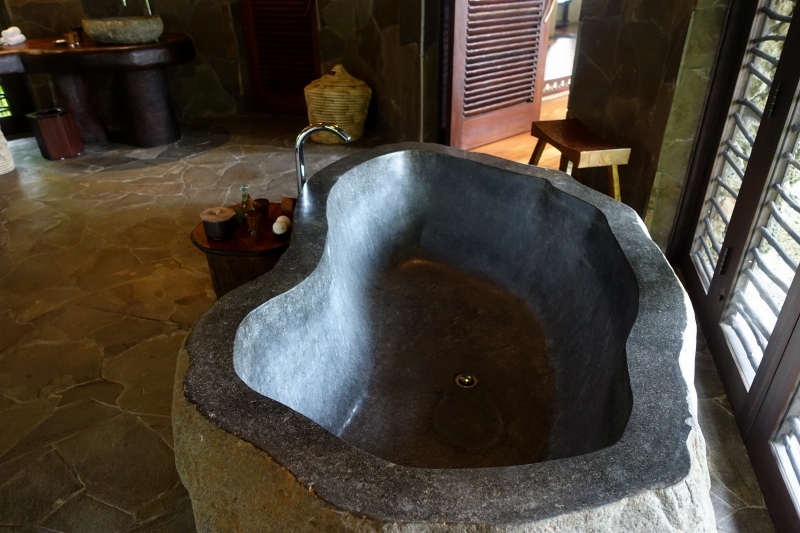 There was also an outdoor soaking tub, pool and seating, as seen in the above video earlier in this post. 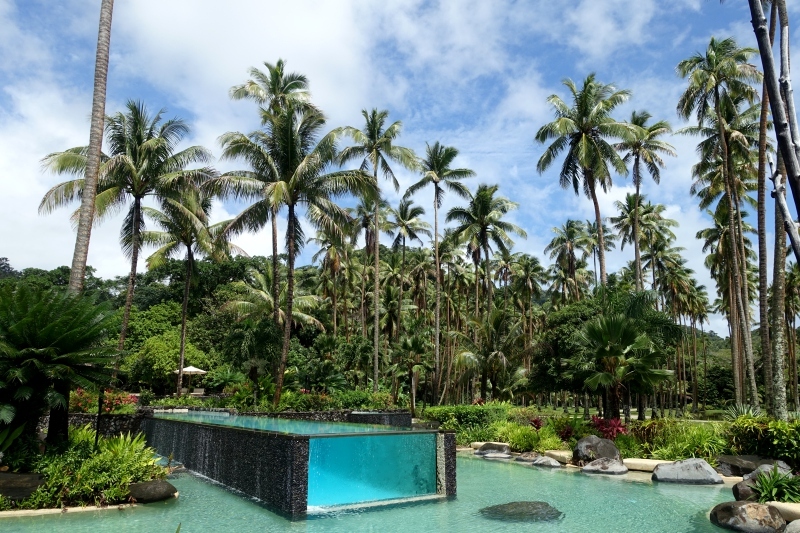 One of the most recognizable photos of Laucala is its rectangular pool, set in a freeform pool that is the largest in the Southern Hemisphere. The pools are beautiful, and you’ll almost always have them to yourself. 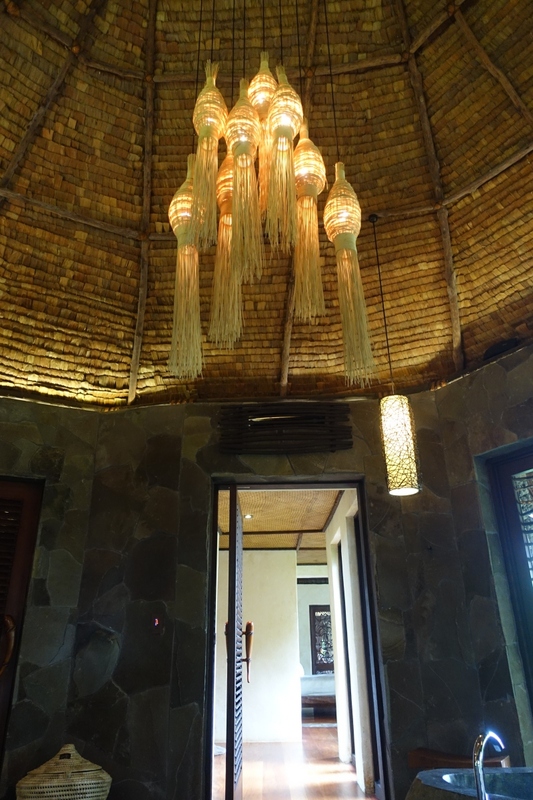 I'll cover Laucala dining and activities in future posts. 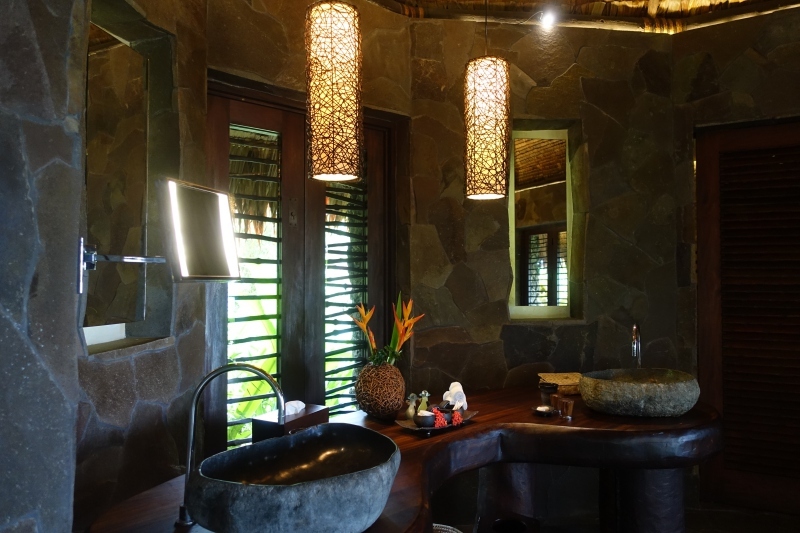 Our expectations were extremely high for Laucala, even for our entry level Plantation Villa, as the ultra luxury all inclusive pricing is $4800 + tax per night for two (there’s also a third person fee of $400 per night). 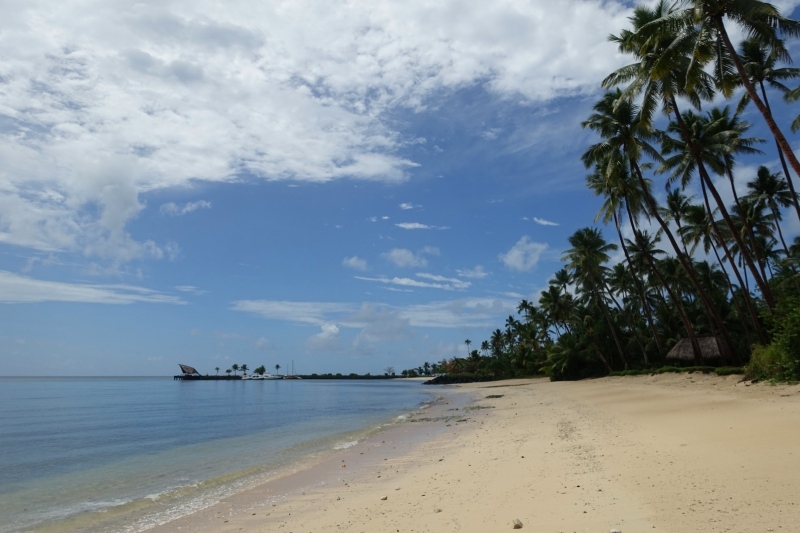 But overall, we were thrilled with our experience, and my husband is mostly worried that no other island resort will ever live up to our Laucala stay. 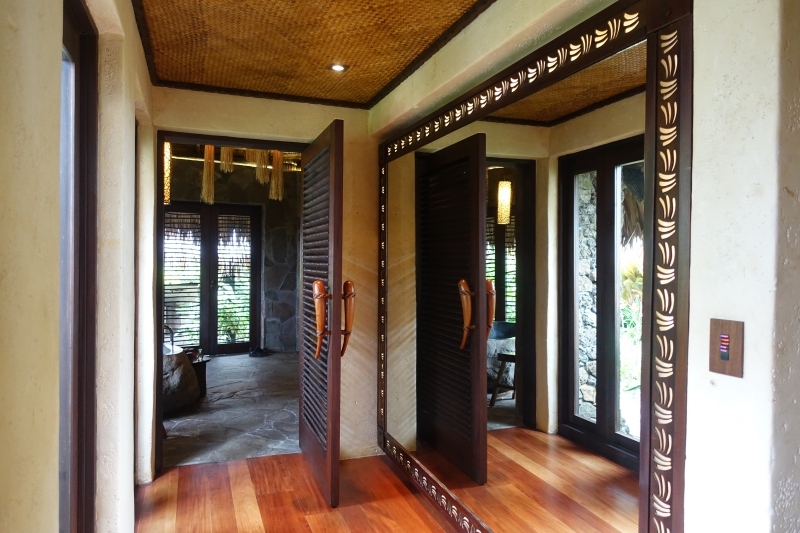 The décor of the villas is luxury Fijian, in keeping with the island’s landscape and Fijian traditions, so if your ideal is modern and minimalist Laucala is not the place for you. We enjoyed the expansive indoor and outdoor space, particularly the separate living area where our son slept (so he could be put to bed early, without us having to go to sleep at the same time); the private pool and effectively private stretch of beach; the indoor and outdoor two person soaking tubs, the shampoo and other bath products that are handmade at the spa, the fully complimentary mini bar, even though we actually typically ordered our wine at the restaurants, and the complimentary laundry. In terms of things I didn't care for, it's true that I would have liked black out shades at night, although our sleep masks worked quite well. Our initial buggy didn't brake all that well on steep slopes, so we asked for another buggy. 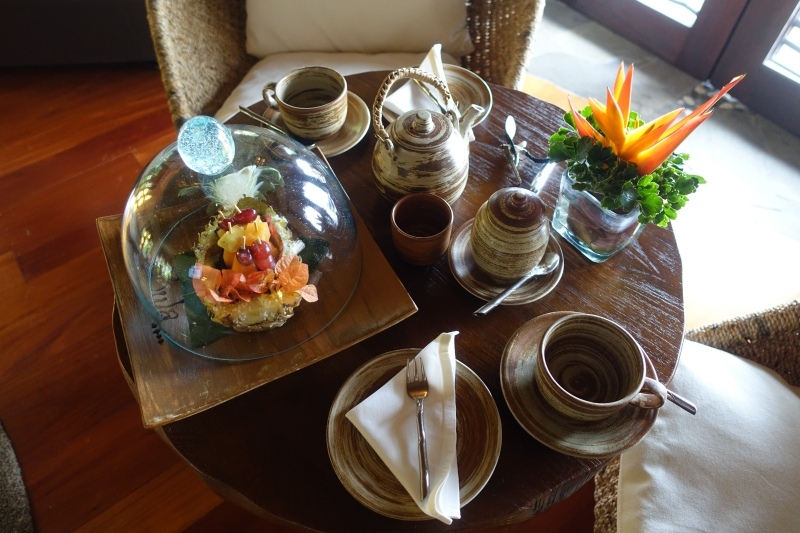 And as I'll explain in the dining post, while we loved our breakfasts, in-room dining and the Thai Restaurant, I thought the tasting menu didn't measure up. 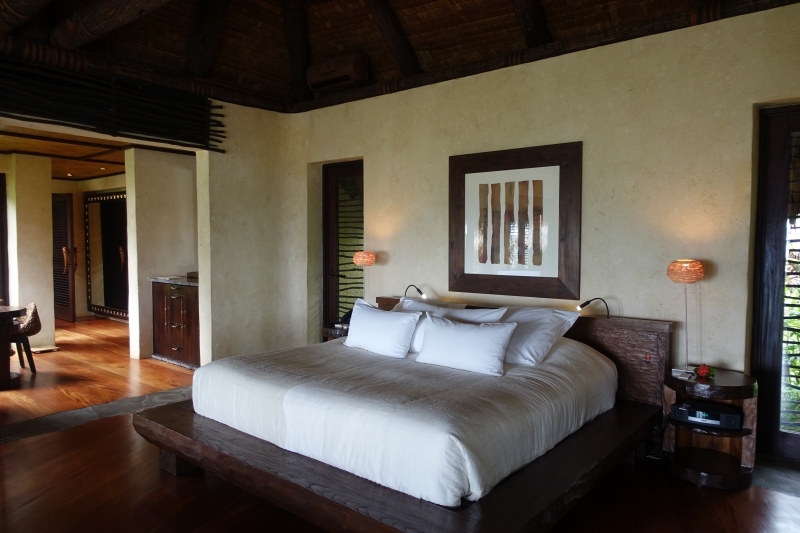 But what really makes the difference at Laucala is the genuine hospitality of the staff. 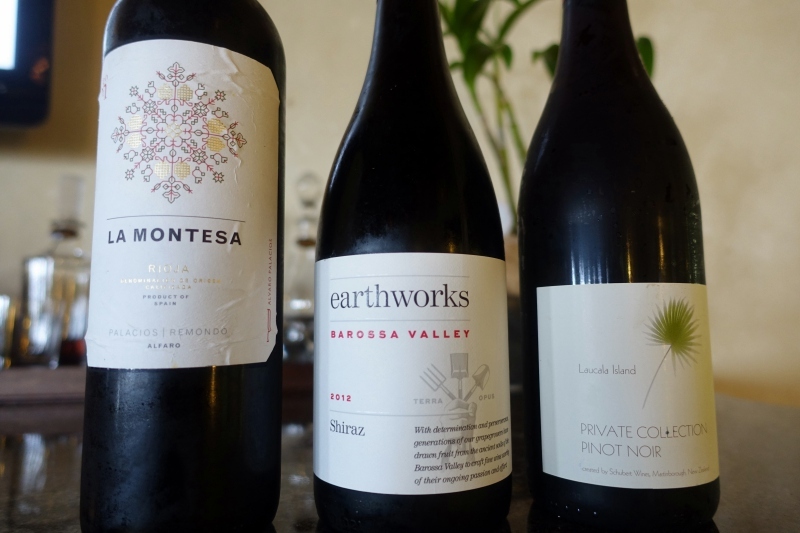 At many resorts, even luxury resorts, the “back of house” staff such as gardeners and maintenance staff don’t greet you, and even some front of house reception staff can be harried and less than helpful. Not at Laucala. Everywhere you go you’re greeted with a friendly “Bula!” The staff seem to genuinely care about us, and this included making a special soup for our son on our arrival day, when he was getting over a stomach virus, as well as squeezing in an impromptu pastry cooking class for him at very short notice. Wherever we were, they even reparked our buggy to face forward, so we didn’t have to back out and turn around. 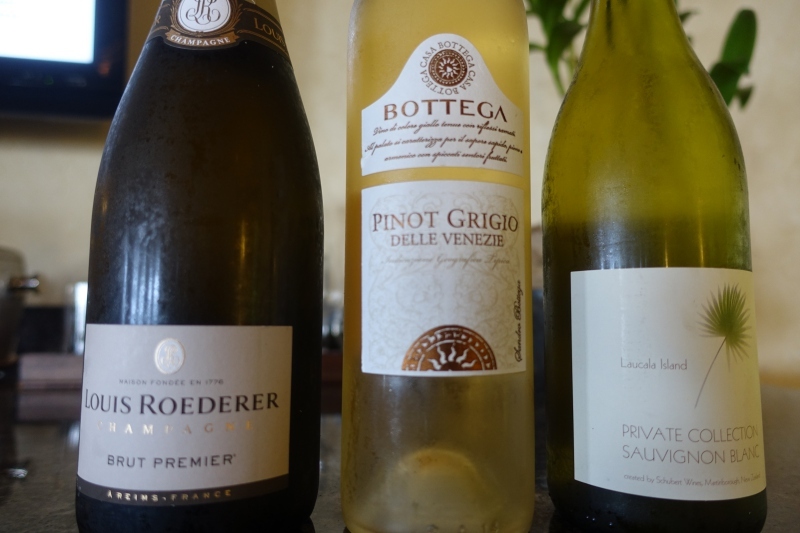 When we were getting ready to leave our villa they even went in to do a final check to ensure nothing was left behind. 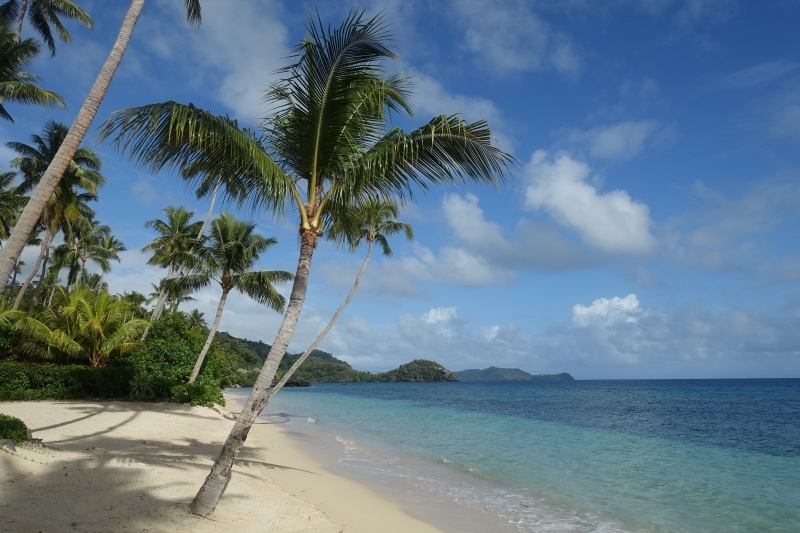 Laucala has many repeat guests, and we met a family who comes every year for several weeks. But even if you have to save up for a year or two, as some of my clients have expressed interest in doing, Laucala is an incredible and worthwhile once in a lifetime experience, particularly those who love the ocean and want to dive, snorkel, kayak, waterski or take a ride in the Deep Flight submarine. 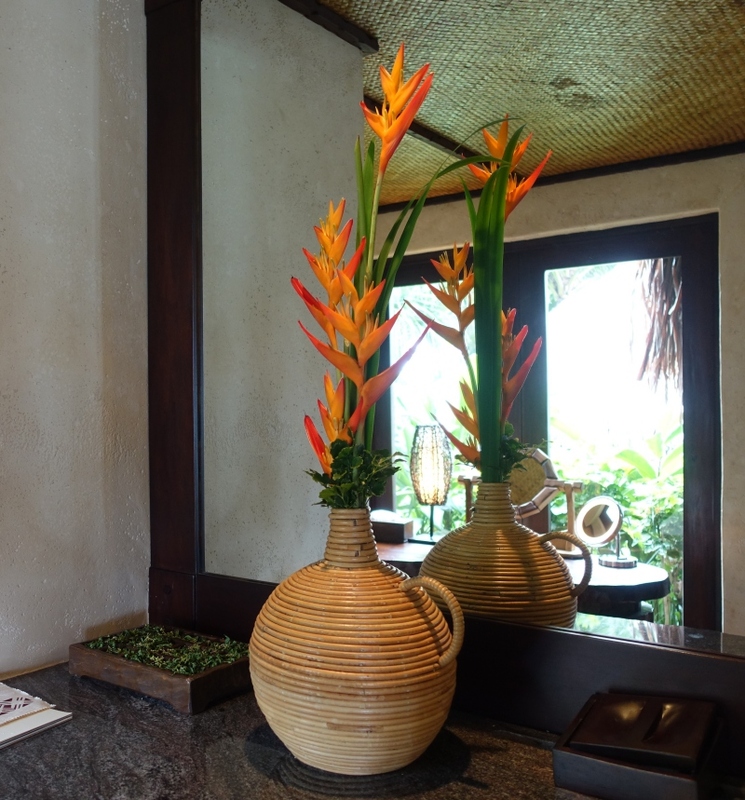 And as I’ll describe in my future activities post, don’t miss a heavenly massage at the spa, or horseback riding. Disclosure: I received 2 complimentary nights for my site inspection visit and reserved an additional 2 nights at a travel professional rate. The opinions expressed in the post are mine.